A project by the World Monuments Fund to renovate the Shwenandaw Kyaung Monastery in Mandalay begins with a 3D scan of the site. The World Monuments Fund announces a grant receipt that will got towards work at Wat Chaiwatthanaram in the World Heritage Site of Ayutthaya. The World Monuments Fund announces the completion of the restoration project on the Churning of the Milk Sea bas-relief in Angkor Wat. Restoration workers in Cambodia sign their first-ever collective bargaining agreement with the World Monuments Fund. 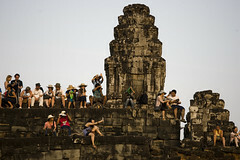 The World Monuments Fund unveils four statues, locally produced and designed as a result of research, and hopes to see them installed on the roof of Angkor Wat’s East Gallery, after approval from public consultation.